A Facebook page shows students Jorge Antonio Mercado Alonso, 23, left, and Javier Arredondo Verdugo, 24. University's rector blames self for identity mix-up: "I offer a public apology"
(CNN) -- A photo on a Facebook page shows them dressed in black suits, white shirts and stylish ties. They're at some sort of dinner and they look straight into the camera, their young faces full of hope and promise and that assuredness reserved for those for whom the future stretches endlessly. That future ended Friday for Jorge Antonio Mercado Alonso and Javier Arredondo Verdugo, shot to death in a firefight between Mexican army soldiers and gangsters who had sought refuge on a university campus. The two mechanical engineering graduate students at the Technological Institute of Higher Learning of Monterrey were good young men, part of the hope for Mexico's future. They were bright students who had avoided the violent drug war that has ripped Mexico apart for the past three years, a massacre that has devoured more than 16,000 of the nation's lifeblood. Mercado, 23, and Arredondo, 24, were scholarship recipients about to graduate with degrees in manufacturing systems. They had been working late at the school library Thursday night, friends told local media, and knocked off well after midnight. They stepped out into the night air and into a violent firefight. Mexican soldiers were chasing criminals who had fled onto the campus after firing on an army patrol, the Interior Ministry said. Interior Minister Fernando Gomez Mont said Monday the students were caught in the crossfire. Initially, authorities had identified the two dead men as drug gang members. University officials had also said Friday after the campus shooting that all students were safe. That account changed Saturday, when Mercado's mother tried to call him after finding out about the shootout. When she couldn't reach him, she traveled to Monterrey, where she identified her son's body, said the campus rector, Rafael Rangel Sostman. On Sunday, authorities at the highest level of the Mexican government admitted their mistake. "The Mexican government expresses its most deeply felt condolences to the families," the Interior Ministry said in a release on its Web page. The federal government will intensify its investigation to find out what happened, Mont said. The school's rector blamed himself for the mix-up in identities. "I offer a public apology and take responsibility for having given information that ended up not being correct," Rangel said. "I want to offer my most deeply felt condolences to the family of our two students and offer them our support in this difficult situation." On Monday, Mercado was laid to rest in his native Saltillo in Coahuila state. Arredondo will be buried in Los Cabos, in the state of Baja California. Separated in death, the two young men seemed inseparable in life. A Facebook page that demands justice for the slayings shows more than 30 photos of the young men and offers a snapshot of lives fully lived even at a tender age. I ask myself, where is the authority in Mexico? I ask myself until when will we have justice in my country? Mercado, an athlete, is shown working out on the rings at a gymnastics club and winning a medal and a trophy in track and field competition, where he was a pole-vaulter. Another photo shows him kneeling between two German shepherds. He's wearing a cap, blue jeans and a T-shirt and has a bemused look on his face. He was also a scholar, working with a team of faculty and students on a solar-powered hybrid vehicle. Arredondo seemed more the social one, with photos of him with his arm around a young woman at what seems to be a party. Another photo shows him posing with a World Cup trophy display. There are several photos of the two young men together -- at a dance, hanging out with friends, in the stands at some kind of sporting event. At least two Facebook pages are devoted to them: "Rest in Peace Jorge Antonio Mercado Alonso and Javier Francisco Arredondo" has more than 12,600 fans; "Javier Arredondo and Jorge Mercado - JUSTICIA! JUSTICE!" has more than 4,700 members. 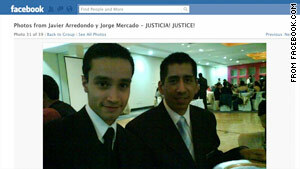 The Justice page was started by Juan Arredondo, Javier's cousin. In a statement on the page, Juan Arredondo said some members of the army tried to scapegoat their "error" by saying the two young men were gangsters. Videos from security cameras on campus would show the two students were innocent victims, Arredondo and others say. "These errors also must be paid for and authorities must establish a punishment," he wrote. "I ask myself, where is the authority in Mexico? "I ask myself until when will we have justice in my country? "No words or speeches or promises will fill the emptiness that Javier and Jorge left when they lost their lives in such a tragic manner. We only want to know the truth and that justice be done. "We demand that the contents of the videos confiscated by the army be shown. "We demand that the responsible parties for killing Javier and Jorge be punished. "We demand a country that tells the truth to its citizens." The "Rest in Peace" memorial page also is full of accusations and recriminations against authorities and their version of what happened. "Don't believe anything. They all evade responsibility," one person wrote. Said another, "Incompetence, negligence and stupidity beyond all comprehension." The killings occurred in Monterrey, Nuevo Leon state. It's one of two states in northeastern Mexico where drug cartel members blocked roads with hijacked vehicles Thursday and Friday to prevent military reinforcements from arriving. The criminals also set up roadblocks in neighboring Tamaulipas state. Three presumed gang members and one soldier were killed in various skirmishes over the two-day period, officials said. The area, which borders Texas, has seen bloody fighting between the Zetas and Gulf cartels after a recent gangland slaying. Hours-long gun battles have been common, and U.S. officials were recently forced to temporarily close the consulate in the city of Reynosa. The trouble started January 18 when a Gulf cartel member killed a top Zeta lieutenant. The Zetas demanded that the Gulf cartel turn over the killers, but the narco group refused. The Zetas, composed mostly of former elite military troops, had been the armed enforcers for the Gulf cartel since 2001. The Zetas have become more independent in recent years, and the all-out war between the two cartels indicates the split is apparently permanent. Mexico has been gripped in massive drug-related bloodshed since President Felipe Calderon declared war on the cartels shortly after coming into office in December 2006. Much of the violence has taken place around Ciudad Juarez, across the border from El Paso, Texas. There are no official government tallies, but more than 16,000 people are estimated to have died in the drug wars. The vast majority of the deaths are among reputed criminals, with some police and military also being killed. The United States and Canada have issued travel warnings, particularly along the border area. The Texas Department of Public Safety took the unprecedented step this year of recommending that students on spring break not go to border areas inside Mexico. Though relatively few of the deaths have been among civilians, Friday's killings were the second in recent weeks to garner worldwide attention and fuel rage among Mexican citizens. Fifteen people, most of them innocent teenagers, were killed January 31 at a party in Ciudad Juarez. For the families of the innocents, the drug war has gone on long enough. At Mercado's funeral Monday, a heart-broken mother asked for the seemingly impossible. "Thank you, son, for these 23 years you gave us," Rosa Elvia Mercado said. "You are great because you are with God. My son was not the first, but perhaps he will be the last."